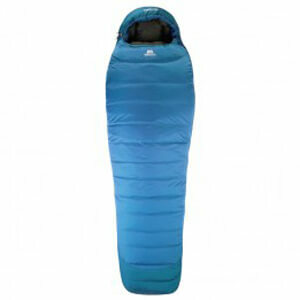 Down sleeping bags are your premium choice when temperatures are within the range of freezing. When it's cold and snowy, a good down sleeping bag will protect the resting body against frostbite. The experience of using sleeping bags on tours of mountaineering or trekking, on expeditions but also for camping shows that a lining of goose down in combination with feathers offers the best ratio between warmth and weight. It doesn't come as a surprise that ambitious mountaineers and fans of outdoor activities prefer down sleeping bags. On expeditions, when mountaineering or when trekking, the equipment needs to have low weight and small packed dimensions. In fact you can save a number of grams when choosing a down sleeping bag. Compared to synthetic fibers down has superior insulation properties. Down lining is significantly lighter than synthetic fibers. Down sleeping bags are also much more compressible. A warm synthetics sleeping bag is always a bulky and heavy pack, whereas the down sleeping bag is light and soft. Both Models are available in mummy shape and oval shape. Filling quantity refers to the amount of down and feathers in the chambers of a down sleeping bag. The bulking power of goose down - also referred to as fill power - is measured in cuin and indicates the degree to which down will expand after having been comprised. The higher the cuin-number, the higher the bulking-power and with it the quality of the down lining of the sleeping bag. Down sleeping bags for outdoor activities and mountain sports are the first choice when light and easy-to-handle sleeping bags are concerned. However, the goose down lining will only offer its insulating power when it is dry. If down is wet, its capacity to insulate heat drops significantly. People who stay in wet and hot regions normally buy synthetic fiber since it dries much faster. But when the ideal ratio between warmth and weight is concerned, down sleeping bags are unbeatable.